I've never thought of synchrotrons as peace making entities, capable of establishing comity between the populations of fractious Middle Eastern countries, but at least two scientists, American Herman Winick and German Guss Voss do. Eleven years ago, they founded the SESAME ( Synchrotron-light for Experimental Science and Applications in the Middle East) in Amman, Jordan with the goal of bringing together scientists from across the Middle East to a single facility. Their vision of Palestinians and Israelis, Turks and Cypriots, Iranian and Egyptians collaborating on experiments has almost come to fruition, were it not for a pesky particle accelerator. The 124m in circumference accelerator is the last component, the key in the door, the final piece of the puzzle to get SESAME up and running. The only setback? A funding shortfall of 15 million euros. In a quote from the BBC article, technical director Dr. Amor Nadji said, " We are scientists; I am a scientist, you are a scientist, and we can talk together even though we are different. And, for sure, if you are a Palestinian you can be close to an Israeli, and you can talk together, you can work together. And maybe this can help." A synchrotron is a particle accelerator designed to produce intense beams of x-ray and ultraviolet (UV) light. Synchrotron light allows scientists to probe further into the composition of matter and are especially useful in chemical, geological and semiconductor material analysis. 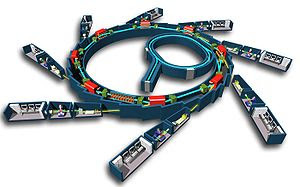 To date, the largest synchrotron in the world is the Large Electron-Positron Collider (LEP) at CERN in Switzerland. Going back to an earlier theme, SESAME is a paradigm of scientific citizenship. Just goes to show that civic science doesn't always involve politics- sometimes bypassing formalities altogether can produce results.